HÀ NỘI — Amateur marathoner Chia-Che Chang, from Chinese Taipei, won the Hồ Chí Minh marathon 2019, which concluded yesterday in Phú Mỹ Hưng, HCM City. Chang won the 42.195km race, which was held with the slogan ‘Dream Big with the City’. The race included familiar distances like Marathon (42.195km), half marathon (21.097km), 10km, 5km and Kids Dash (1km), designed for professional and amateur athletes of all ages and nationalities. It attracted 9,000 competitors from countries including the US, Japan, South Korea, Philippines and China. “This race is food for the soul I can’t live without. 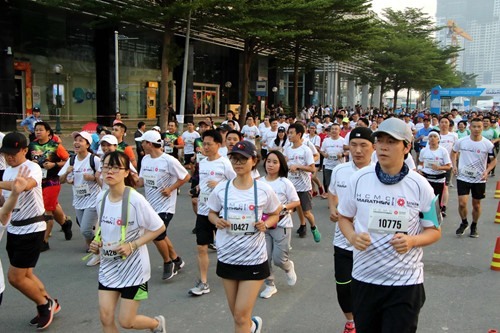 For a man who is busy with work all the time, running is a must at the weekend,” said Nguyễn Trung Tín, a runner.